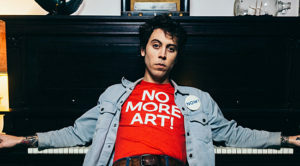 Canadian singer-songwriter Daniel Romano’s latest effort, Modern Pressure, sounds like vintage Bob Dylan. The album’s dynamic horn and nasally vocals give it a retro feel. It’s yet another significant achievement for the prolific Romano, who recorded at a minimalistic cabin in secluded Finnsäs, Sweden with additional string and horn players laying down their parts at Baldwin Street Sound in Toronto. Romano recently phoned us from a Lancaster, Pennsylvania tour stop to talk about the album. You started playing drums with your family’s band, is that right? I was 12 or 13 when I was playing with them. It was a rhythm and blues band. I wasn’t allowed to be in the bar when we weren’t performing, so I spent a lot of time drinking ginger ale and hanging out with the kitchen staff. I didn’t think much about it at the time, but it showed me the simple enjoyment of performing music and probably rhythm, to some degree. Talk about playing with Attack in Black. What was that like? Punk rock was the easiest style of music to write. It’s also what I wanted to be writing. I wrote short stories and things like that. I have always been a student of music and back then there’s a certain amount of head nodding and copying and emulation that you have to go through to get your bearings and figure out how it’s done. How’d you end up gravitating to alt-country? My old band [Attack in Black] made what I would consider a folk rock record that did really well in Canada. It was on the more aggressive side musically. We wanted to diversify immediately, so we made a stripped down record, much to the chagrin of the label at the time. They appreciate it now. We just wanted to make different records all the time. We liked all kinds of music, and we didn’t want to be put in a box. They didn’t really know what to do with us. Things became difficult relationship-wise. It’s all fine now between us and them now. Not getting stuck anywhere has always been very important to me. That’s kind of how I wound up doing something different. Since releasing Daniel, Fred & Julie, you’ve been really prolific. What’s the key to producing so much material? Just always doing it. I don’t ever take a break. It’s what I love to do anyway. It’s what I do when I have what I guess would be considered time off. What inspired the approach on Modern Pressure? There were a few songs I thought would benefit from some type of arrangement like that. I didn’t have a set musical vision for it. It was pretty song-based. I knew I wanted it to be drum-centric. Beyond that I didn’t have a sound in mind, other than for the drums, which build an album more than you think. Drums are importantly sonically to what is going to work. I did all the drum tracks first, as I usually do. That lent itself to whatever it sounds like now. What was it like to record at the cabin? I had a month off in Sweden and that was the place offered to me by our promoter in Karlstad. I didn’t know what else I would do. She arranged to get everything we needed instrument-wise from the townies really quickly. Within four hours, we had everything we needed. It was crazy. It was just me and the engineer hunkered down. It was really great. We would get a little loopy. How did the room contribute to the sound? Not much. I use dynamic microphones, so it’s all close and tight. I imagine it was more dead drum-wise than if I had recorded at home. It was recorded on an eight-track cassette so I doubt anything environmentally was a factor. The songs have a Dylan-like quality to them. Do you think of him as an inspiration? I would think that Dylan should be an inspiration to anyone who wants to write songs. “I Tried to Hold the World (in My Mouth)” is such a trippy tune. What’s the story behind it? I don’t know. I have no idea. A lot of these things make sense at the time and then they lose their touch with me and hopefully gain some other conscious beyond their conception. I think that’s the goal of the song really. I’m sure it was very specific at one point or another. How does it work live? It’s a five-piece rock band. We have two electric guitars and bass, drums and organ. It’s been really fun to play these songs. I’ve never been one to emulate a recording. The live show is its own entity for me. I don’t really revisit albums. I just revisit songs and however that suits a live setting best. That constantly evolves too. You do visual art and write fiction and poetry too? I do, yeah. I wrote some plays last year but I haven’t written short stories in a while. It’s all the same expressions. Other than plays, it all feeds the same things. The artwork is always for the use of something artistic and the production and recording and all of that. I see it all as a whole unit. I think my mind is very project-based. This comes from the punk days and is still relevant now. You can’t afford to hire someone to do this or trust anyone to execute your vision. Early on, I had to teach myself to do all the aspects of making an album and all the elements involved in bringing it to its conclusion. I like every aspect of it. The whole thing is very enjoyable for me. I love hearing an album like yours that has an old-school approach. That’s unavoidable on an eight-track cassette recording with the lowest possible fidelity. We did a good job of zipping it up. It was a good machine.